Supporting partnerships between schools and sports to deliver attractive and relevant sporting experiences. 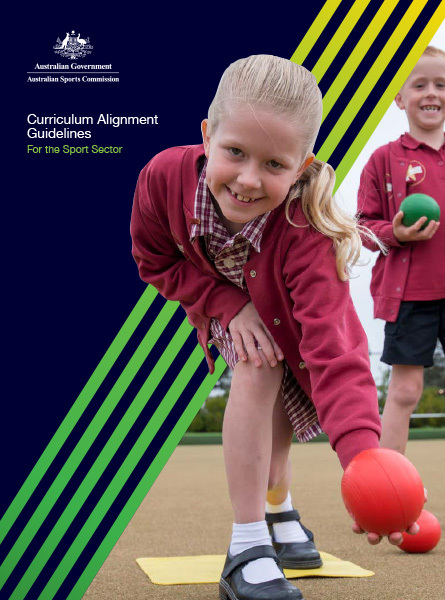 The Curriculum Alignment Guidelines assist sports in understanding how to design or adapt school-based products and resources to align with the Australian curriculum. The guidelines provide an overview on the benefits and key considerations of alignment as well as step-by-step instructions that sports can follow when developing or adapting their resources. Aligning with the Australian Curriculum increases the relevance and credibility of your products and resources, supporting teachers to deliver quality Health and Physical Education (HPE) and sport programs. providing strategic advice on promoting and marketing to schools. Offering the flexibility of print and digital options increases your reach and opportunity for adoption with teachers. Each format requires different considerations. Print (hard copy) resources need to be easy-to-navigate, include images to illustrate skills and durable to support regular use. Digital (online) resources should include hyperlinks to related sections, videos to illustrate skills and a layout that supports both phone and tablet use. How do I align to the curriculum? There are four steps you must follow when aligning your products and resources to the curriculum. The first step is to identify what you want students to learn about your sport. These are what are referred to within the curriculum as learning intentions and should be used as a reference point throughout the resource development. What do you want students to know? Once learning intentions are identified, you must explore where the learning is covered in the curriculum. This information can be found in the Achievement Standards and Content Descriptors for the band/s your product or resource is targeted towards. Achievement standards describe the understanding and skill a students should be able to demonstrate at the end of each band level. It is not possible to address the entire achievement standard in one product or resource. It is recommend that you identify two to three elements from the achievement standard that link to what you want students to learn. Students demonstrate fair play and skills to work collaboratively. They access and interpret health information and apply decision-making and problem-solving skills to enhance their own and others’ health, safety and wellbeing. They perform specialised movement skills and sequences and propose and combine movement concepts and strategies to achieve movement outcomes and solve movement challenges. They apply the elements of movement when composing and performing movement sequences. Content descriptors specify what teachers should teach and what students should learn within each band. They describe the knowledge, skills and understanding that students should complete as they progress through their schooling. Content descriptions include elaborations or sample ideas that provide a deeper understanding of how to teach the content. Demonstrate ethical behaviour and fair play that aligns with rules when participating in a range of physical activities. When developing activities think about how teachers might assess students. It is important to include cues for teachers to understand what good performance looks like and include key teaching points for how to adjust incorrect technique or performance. Consider what students should understand and be able to do at the end of each session. Learning activities provide the direction to teachers about what they can teach to students for them to achieve the identified learning intentions of the resource. Students understand key concepts and strategies to enhance performance in your sport. In basketball there are a number of strategies that can be used to stop players scoring inside the key. Do not forget the key elements that ensure your resource is appropriate for the school environment. For further information or to download the Curriculum Alignment Guidelines. The Australian Sports Commission (ASC) has a strong focus on building the sport sector’s capacity and capability to increase access and participation in sport for all Australians, in particular children and young people. Schools are a great marketplace for sports to gain exposure and increase participation through positive experiences. However, this market is competitive and each school’s core concern is for their student’s learning and wellbeing. As a result, it is important to apply relevant customer insights to the development of programs and resources to ensure that sports are remaining relevant by meeting the needs of teachers and students. Subsequently, one of the best ways to be successful in the education market is through the alignment of programs and resources to the Australian Curriculum.The ASC’s Curriculum Alignment Guidelines aim to assist sports in understanding how to develop or adapt resources to align with the Australian Curriculum. The guidelines provide an overview on what is involved, the benefits of alignment, and the key considerations for this process. It also includes a step-by-step process that sports can follow when developing or adapting resources.